The 13th century Sufi poet Rumi traveled in a landscape divided between the Persian and Byzantine empires, and his works express the passions, fables, and faith of both worlds. In this book, Rumi enthusiast Kamla Kapur reworks some of his writings into 30 tales of wit, wisdom, and faith. The basis for her stories is Reynold A. Nicholson’s translation of Rumi’s six-volume Mathnawi, an epic mystical poem of more than 25,000 verses. Kapur brings this dense, intimidating work into a far more readable form, putting her own spin on the stories yet remaining true to Rumi’s vision. In charming tales such as “The Witch of Kabul” and “Moses Learns a Lesson,” she brings Rumi’s verses to life as clever fables. Pilgrimage to Paradise gives readers one of Persia’s greatest literary treasures in an accessible form that enlightens as it entertains. It seemed to all the courtiers that their king, Mahmoud of Ghazni, had become completely mad. In the morning assembly, he took out of his pocket a large, lustrous pearl that filled his palm and glowed even in the day. The king put it the vizier’s hand, and said to him: ‘What do you think is the worth of this pearl?’ ‘I would guess at least a hundred horse-loads of gold,’ the vizier replied, rubbing his beard. ‘Place the pearl in this mortar and break it with this pestle!’ the king commanded him. ‘Break it? Your majesty!’ the vizier protested. ‘Surely you are testing me. I am a well-wisher of your treasury my lord, and will not harm it in any way. This pearl will make your highness far wealthier than you already are and I wish my king the absolute best in financial matters.’ The king was silent for a while, and then burst into laughter. ‘Well said, well said, old vizier! Here, give me back my pearl and here is a robe of honour for you as a reward for your loyalty to my treasury!’ After conducting some business of the day, the king once again brought out the pearl from his pocket and put it in the palm of his treasurer, and asked him, ‘What do you think is the worth of this pearl?’ ‘At least worth half a kingdom! May God preserve it from destruction and thieves!’ ‘Break it!’ cried the king again, handing him the mortar and pestle. ‘Your majesty,’ the treasurer replied, holding the pearl up to light. ‘Never in all my life have I seen anything like it, and I have, as you know, seen many gems. Observe this play of light on its surface, its translucent lustre, its colour . .. ah, the best, this shade of delicate rose which is an indication of its incomparable worth. Observe its roughness to the touch. There is no doubt this is the real thing. And its shape, ah! A perfect sphere. It comes from at least twenty fathoms deep in the sea and weighs, I would say, about fifteen hundred grains. Ah, your majesty, nothing like this exists in the whole world! Break it? Why, I would sooner break my head!’ The courtiers laughed, and after his customary silence, King Mahmoud joined them in laughter. ‘I am surrounded by people who value my treasury! What a boon! I am surrounded by intelligent, practical men bent upon my good.’ The king said, ‘Ah, my treasurer, what poetic, descriptive talents you have! How shall I reward you for saving me this wonderful pearl? Here’s a carriage with six white horses as your very own.’ The king wearily conducted some more business signed some more papers and discussed plans for another conquest. But once more he returned to the subject of the pearl. This time he put it in the palm of his amir, who had already decided based on the examples of the others what his response to the king’s insane command would be. He too waxed poetic over the pearl’s worth and beauty, and he too was rewarded handsomely for it. So the king approached all his officials, all of them preserved the pearl and all of them received rich rewards and salary hikes. At the end of the day, the king looked very dejected, and was about to retire when he noticed a rough, ragged-looking young man in a torn and heavily-patched sheepskin jacket and worn out shoes standing at the entrance of his court. His lustrous, curly, dark hair hung in ringlets about his face, which had a translucent glow upon it like the nacreous shine of the new moon. ‘And what’s your name?’ the king asked. ‘Ayaz, Sire,’ the man bowed low in respect. ‘And what do you want, Ayaz?’ the king asked. Ayaz dropped to his knees before the king, held his hand, kissed it and said, ‘To love and serve you, Sire!’ ‘How much do you think this pearl is worth?’ the king said, dropping the pearl into Ayaz’s tough and leathery hand. with this pestle.’ Without a moment’s thought or doubt, with no anxiety or fear of consequences, oblivious to reward or punishment, Ayaz brought the pestle down with a powerful movement of his hand and smashed the pearl to dust. The people in the court gasped in shock and made movements as if to arrest Ayaz. ‘You have broken the king’s invaluable pearl!’ they cried. ‘Infidel! Uncouth, ignorant fool! Enemy of the king! Kill him! Kill him!’ The king’s many ministers pounced on Ayaz and would have finished him off if the king hadn’t intervened. ‘Release him!’ cried King Mahmoud. The officers reluctantly let him go. The poor shepherd now looked even more ragged and dishevelled. ‘What do you have to say for yourself, young man?’ the king queried. This compelling page-turner – which is a rich tapestry of fables, scenes from everyday life, Koran based exegesis and metaphysics – provides us with the quintessential Rumi worldview. Kamla K. Kapur brings the wisdom of 13th-century Sufi poet Rumi to modern – day readers in her engaging interpretation of his work. Rumi’s Tales from the Silk Road is an eloquent call to our hearts and souls to return to our spiritual home. Contemporary and accessible, this collection reflects both Rumi’s relevance to the modern world and the essence of his vision. Kapur has culled some to the best tales of Rumi. The stories are touched with the finest wit. 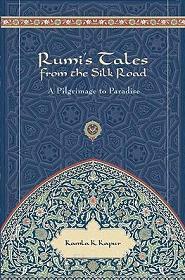 Kapur’s lucid introduction to Rumi’s life and thought will lead the 21st century reader on a journey of spiritual quest. BOOK RELEASE: AMERICAN CENTER, US EMBASSY, NEW DELHI, SEP 2009.